The pretty market town of Bury St Edmunds in Suffolk is my hometown. I don’t think I fully appreciated Suffolk when I lived there. It was only while I was away at university in Yorkshire that the low rolling hills became something I looked forward to seeing again. (Now I live in flat Cambridgeshire it’s the hills and dales of Yorkshire I pine for!) I certainly didn’t appreciate Bury St Edmunds but the town has a lot to offer. A couple of years ago David and I decided to approach Bury with fresh eyes and spend a day there as a tourist. We were partly inspired by my favourite book for planning things to do locally. And partly inspired by the Lego exhibition the local museum were putting on. We also planned in a couple of multi-geocaches which would take us around the Cathedral and the Abbey Gardens. We started our day at the Moyse’s Hall Museum. The exhibition was small but very good and gave a us a chance to look round the rest of the museum. I have been in the museum before but I don’t recall ever looking around (I did have some artwork displayed there once, age 6). There’s plenty for children to do, it’s very interactive with dress up and quizzes. My guide book highlighted a book made out of the skin of a criminal as a ‘must see’. The story behind it was very interesting, if a little grim. The book is in the final room of the museum before you return to the entrance/gift shop and is surrounded by instruments of torture, all with their own tale to tell. From here we headed down through the town to the Cathedral for the first of our two geocaches. (If you don’t know much about geocaching you can read my quick guide here.) This cache had us looking for clues all over the expanse of the Cathedral’s interior and was a great way to guide us towards details we might otherwise have missed. The second geocache we did took us from the cathedral around the Abbey Gardens. The Abbey Gardens is a large and beautiful park set around the ruins of the abbey which was torn down by the townspeople. It is also where I spent a lot of time ‘hanging out’ as a youth. 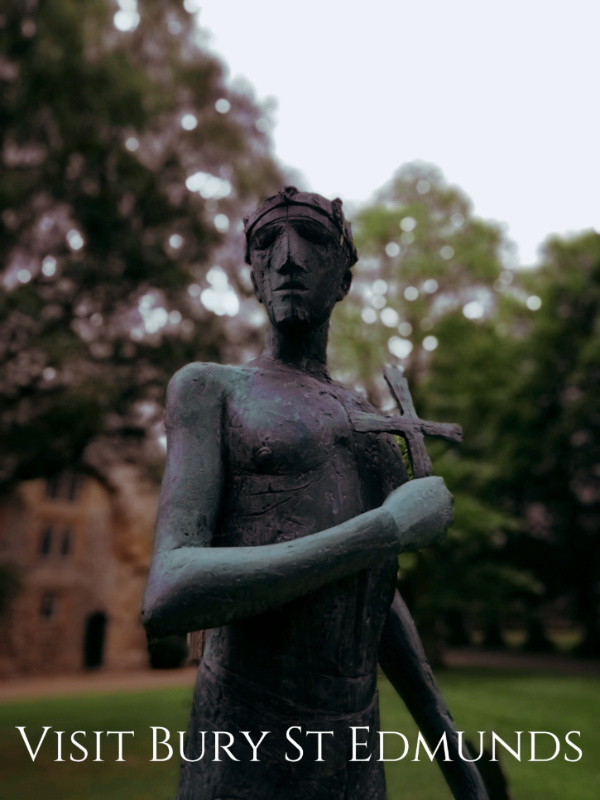 Keep reading for more about the Abbey Gardens. From here we headed out of town on a linear walk along the river Lark. A really peaceful way to end our day. 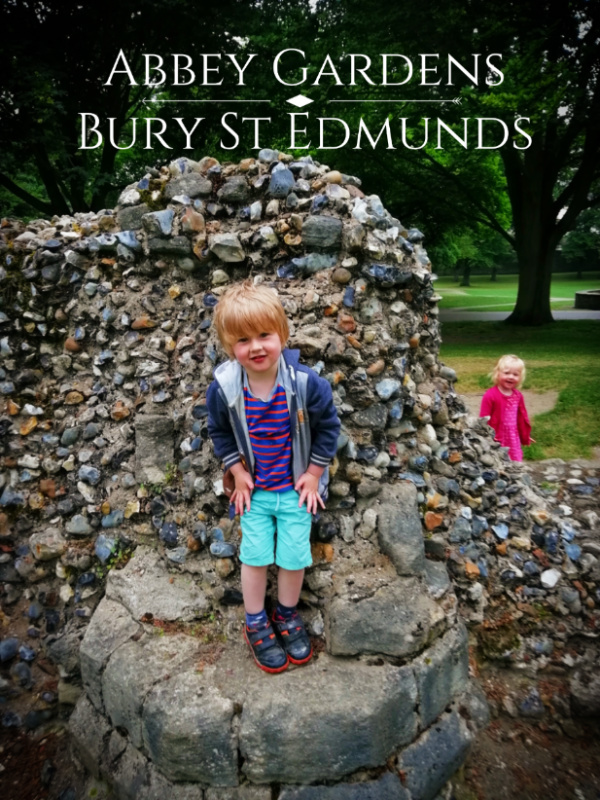 If you only had one day to visit Bury St Edmunds this is an ideal itinerary. 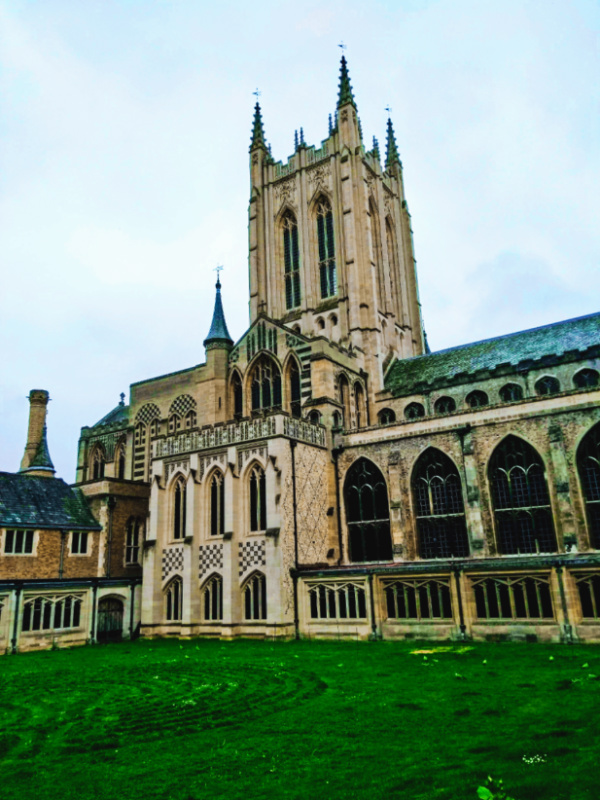 There are plenty of reasons to visit Bury St Edmunds. Not least the markets. They do have a local market twice a week (Wednesday and Saturday) and the occasional special market but it’s the Christmas Fayre that really draws in the crowds. This market is huge. It spills out of the traditional market square down side streets, filling buildings, and covering the Angel Hill and Abbey Gardens. Stallholders and shoppers alike come from far and wide for one long weekend in November. We always make time to visit on one of the days. We usually aim for Thursday evening or Friday when it is quieter. You can’t get round with the pushchair on the Saturday! You’ll find everything you could possibly want from a Christmas market. From handmade local crafts to creepy dogs with flashing eyes imported from China. The food includes all manor of things to fill a Christmas hamper, cheeses, chocolates, chutneys and booze. If you need a snack while you shop why not try a curry and wash it down with gluwein? I will write a full guide to the Bury St Edmunds Christmas Market closer to the festive season. What I’m saying now is, if you would like to visit Bury St Edmunds, you could do worse than the last weekend in November. But beware the crowds! Bury St Edmunds is blessed with some excellent parks. I will save a full guide for another post but I thought they were worthy of a mention here. Anyone who has kids loves a park, but what do I look for in a good park? At the very least a decent play area is required! Also important for us is a decent walk with lots to see and do along the way to keep the kids feet going. 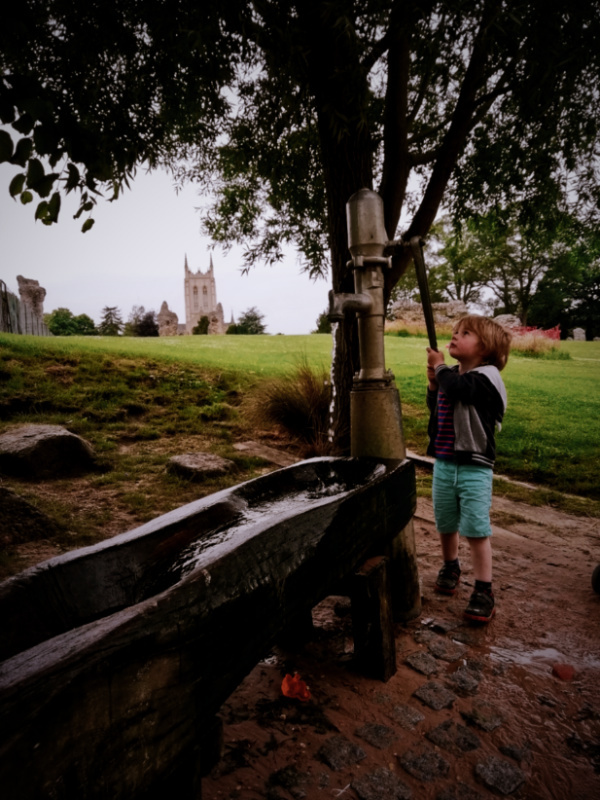 I could list off all the great parks that meet this criteria around Bury St Edmunds but for today I will focus on the one I talked about at the beginning of this post. We’ve visited the Abbey Gardens many times since. From the town centre you approach the Abbey Gardens down hill and enter through the Abbey gate. From here you are presented with a choice. You can turn left to aviaries and small café, straight on for the formal gardens or right for the bowling green. If you go left or straight on you will end up following the path down toward the river where you will find the incredible play area which features a sand play area alongside the traditional play equipment. There’s also a larger play area for older kids. It’s slightly tucked away which stops it being too tempting for an overly ambitious 3 year old. For me what makes the Abbey Gardens special is the area from which it get it’s name. The abbey ruins aren’t the best preserved in the UK. 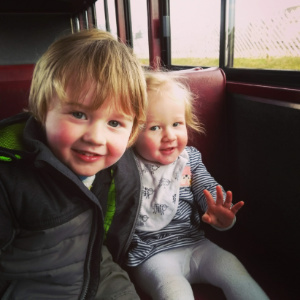 From a historical context they are interesting but my two are a little young for that. What they are at the moment are a fantastic playground. You can climb all over what remains of the flint structures and they make a great maze. Have you ever looked at your hometown as a tourist? Would you recommend we visit?